I just wanted to see a thread where everyone could share pictures from the musical I don't care if they're old, new, rare or the ones we've all seen a hundred times before, funny ones, silly ones ... It would be nice if there was any information about them posted too. I'm going to start with this really adorable Cosette picture- does anyone know who she is? No pictures here, but that looks like a lovely production. I'm very fond of the warm colors. ^ I love the Lovely Ladies and the pimp's costume! (: The production itself looks great. TheHighestPie wrote: No pictures here, but that looks like a lovely production. I'm very fond of the warm colors. The barricade was my favorite (lighting wise). Hands, Marius! Now is NOT the time! Is Enjolras...bald? I know I sound like a snob, but...yeah. That's Bossuet's thing. Bald with a goatee, even. I assign that to Gueulemer. lesmisloony wrote: Bald with a goatee, even. I assign that to Gueulemer. Nooo! That's look is way too Gueulemer. I'm disturbed. There are some things money can’t buy: for everything else, read Les Misérables. parnasse, I really like the way ECAET is done there. Looks like a really good prodution. And on a shallow note, the Marius is smoking hot. ^ Oh, that's not shallow at all. I'm quite happy that we had a hot Marius. 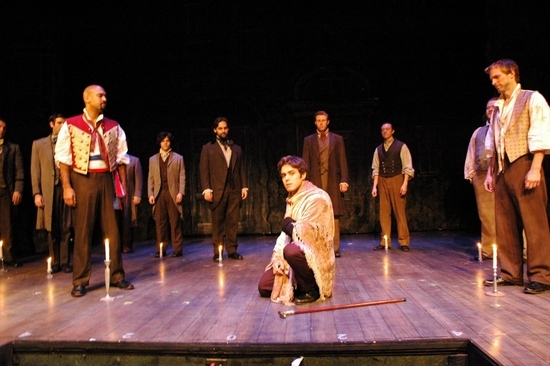 And yes, that is Enjolras with the goatee and no hair. He was actually really quite amazing (and super nice, too). I told him on closing night that he was definitely in the top three of Enjolrases that I had heard/seen throughout the years. No matter how good his acting/voice are, I'm afraid I will never be able to buy an Enjolras with that look. When I saw him in London Edward Baruwa wa an insourmontable challenge for my suspension of disbelieve capacities. And my friends had exactly the same problem. A bald Enjolras simply doesn't work for me.